A person’s health is the result of hereditary factors as well as of the influences that it accepts from its environment. Among all the environmental factors that affect the human organism (including smoking, toxins, physical activity etc), the role of nutrition is extremely important as we are constantly exposed to food, throughout our lives. Thus, nutrition is among the most important, if not the most important, environmental factor affecting the human organism. (Ordovas & Corella 2004). Until quite recently in the history of mankind, different populations were dependent on food that was available in their immediate environment: i.e. foods whose cultivation or availability was favored by the climatic and ecological conditions of each area. Accordingly, different populations have managed to survive and develop in various climatic and ecological conditions, which have respectively led to the formation of different diets and nutritional habits. Different diets, even if they could ensure the good health of people until the age of reproduction, were not necessarily connected with wellness at a later age or with longevity. Thus, during the history of man on earth, there were various ecological, socio-economic and cultural factors which contributed to the formation of different digestive practices in various areas, which did not have, however, the same potential as far as health was concerned. (Willett 2006). The island of Crete had attracted the attention of the scientific community as early as 1948, when researchers from the Rockefeller Foundation of the United States were summoned by the Greek Government in an attempt to improve, in the post-war era, the “bad” living conditions of the Cretan population. Within this framework, a detailed assessment of the Cretan diet was performed, and –to the surprise of the researchers– it proved to be nutritionally sufficient, with only a few exceptions which were limited to areas with a very low income and very limited food production by the families themselves (Allbaugh et al. 1953). In general, the researchers concluded that “in total, the way of nutrition and the nutritional habits were very well adapted to the natural and economic resources of the area, as well as to the needs of its inhabitants”. The connection between the diet and the health of the inhabitants of Crete became widely known in later times, with the study of Seven Countries. This study was started shortly before 1960 by the American Acel Keys and his colleagues, due to the impressively low mortality and cardiovascular diseases rates observed in the area. Indeed, according to data of the United Nations, there was no other area in the Mediterranean with such a low percentage as Crete, both before and after World War II (Allbaugh et al. 1953). The study included approximately 13.000 men, which were selected from among 16 different areas of seven countries (Finland, Netherlands, Japan, United States, Italy, Yugoslavia and Greece), in order to examine the, still unclear then, connection between diet and occurrences of cardiovascular disease. Comparisons conducted between different areas showed that the population of Crete presented the best health status and the lowest mortality rates from coronary disease and cancer compared to all other populations which took part in the study (Keys 1970;Keys et al. 1986; Menotti et al. 1990; Menotti et al. 1999). After 20 years of observation, Cretans demonstrated the lowest death rates from any cause (Menotti et al. 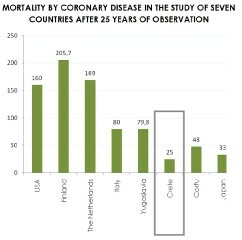 1990), and after 25 years the deaths due to coronary disease in Crete were impressively lower by comparison with deaths occurring in the populations of the United States and Northern Europe, as well as in comparison with other areas of Southern Europe, such as Italy, Yugoslavia, and Corfu (Menotti et al. 1999). As shown in Figure 1, deaths from coronary disease in Italy and Yugoslavia were almost three times greater, while in Corfu they were almost twice those observed in Crete. Figure 1. 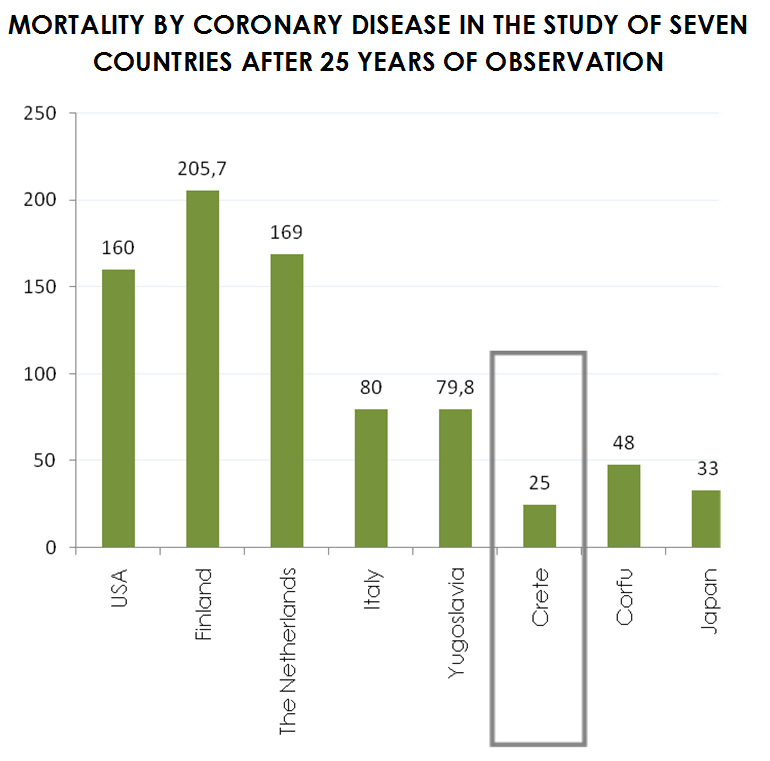 Mortality due to coronary disease per 1.000 individuals in the populations examined in the Study of Seven Countries, after 25 years of observation. The average mortality is provided for two populations from Finland, three populations from Italy, 5 populations from Yugoslavia and 2 populations from Japan. None of the other populations presented a lower mortality compared to Crete. In the United States, as well as in Holland, only one population was studied. The lowest occurrence of coronary disease and cancer, as well as the lowest mortality by any cause observed in the population of Crete, was attributed to the particular nutritional habits which characterized this area (Kromhout et al. 1995; Menotti et al. 1999). Following the study of Seven Countries, the French researchers Serge Renaud and Michel de Longeril demonstrated by the Lyon Heart Study that the use of a Cretan type of diet in patients with myocardial infarction reduced the death rate by 70% in 27 months after occurrence, compared to the diet which was recommended by the American Heart Association (De Longeril et al. 1993;De Longeril et al. 1994). Moreover, after 4 years, the Cretan diet was associated with a decline in the death rate of 56% and a decline in the rate of cancer by 61% (De Longeril et al. 1998). Cretan diet or Mediterranean diet? The traditional diet of people in the Mediterranean was the result of important developments taking place during two millenniums, primarily influenced by the Greeks, the Arabs, the Asians and the Americans (Padilla et al. 2001). Almost 20 countries, with quite a few differences between them, can be characterized as Mediterranean, with their food habits varying due to their religious, economic and cultural particularities. Thereby, the term “Mediterranean diet” can be a little deceptive, since in reality there are not only one but quite a few Mediterranean diets. The term “Mediterranean diet”, as used today, was in fact introduced by scientists in the food industry to describe the Cretan diet, as well as other diets in various Mediterranean areas which presented common features with it, during the 1950s and the 1960s, when the impact of World War II had faded and the “fast food culture” had not yet appeared. As olive oil constituted the primary source of edible fat in the Cretan diet, the term “Mediterranean diet” describes in fact the nutritional pattern that prevailed in the Mediterranean areas which had been traditionally cultivated with olive trees (Willett et al. 1995).